How painful to only enjoy good peaches from June to July. Everyone knows a good ripe, juicy peach is often hard to find with local commercial chains peddling the unripened, often mealy ones. Most civilians aren’t aware that leaving them in a paper bag for a couple of days is the remedy. 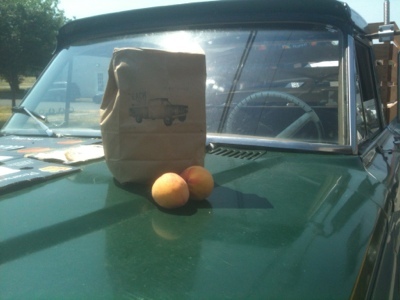 The Peach Truck typically takes this process out of the equation by bringing you the best peaches from his aunt & uncle’s very own peach farm in Fort Valley, Goergia. The farm is located southwest of Macon on 1500 acres of supple peaches awaiting Nashville local chefs and foodies alike to whip up salivating culinary creations. I spoke with Steven Rose briefly, the man behind the tweets and pickup truck instagram shots. He says briefly after he and his wife married and began their lives in Nashville. He had somewhat of a hard time finding peaches to his satisfaction. He shared this hardship with his aunt and uncle who inspired him to bring the edible candy up the interstate to you and me. You can find these incredibly delicious peaches outside of denim clothiers imogene & willie’s in the 12 South Neighborhood. As well as the Nashville Farmer’s Market located off Rosa Parks Blvd. Follow them on Twitter and Facebook to find out how you can your hands on these summer obsessions. But sorry, you’ll have to wait till next summer because peach season’s over. Unless you know something we don’t. Peach Recipe. Here’s a simple but delicious Peach Cobbler with a White Chocolate Sauce you can make with your bag of peaches. 2. Add first 4 dry ingredients for topping, set aside. Using a hand held blender, blend together your butter, egg, and vanilla. Add your dry ingredients a little at a time until all combined. 3. You can opt to use two 12 oz. ramekins or a 1.5 qt baking dish. Place sugared peaches in the bottom of ramekins or dish. I like to add a couple of dollops of butter in at the last minute. Completely optional, about a T. Spoon your batter over the top of the mixture. Don’t worry about covering it evenly. It will spread. Bake for 40 min. or until top of cobbler is lightly browned around the edges and peaches are bubbling around the sides. 4. Put the the white chocolate & oil into a microwave safe dish. Temper in 20 sec. intervals using a spoon to stir the mixture in between the intervals until completely melted. Top off your cobbler and Enjoy! Love white sauce, peaches and this new look. Thanks! I hope you’ve had a chance to try those peaches. There amazing! And I’ve still got work to do on the look but thanks!…Im a little bit of a perfectionist. It was so great to meet you at the Nashville Food Bloggers Food Styling event last Saturday. Thanks so much for coming. This recipe looks divine. I have some almost ripened peaches (in a paper bag!) on my kitchen counter that are calling my name. It was a great pleasure meeting you as well. I learned so much and Thanks for sharing the knowledge of your craft with the rest of us. I have yet to get this summer’s supply of Peach Truck peaches. I’m so ashamed. Those things are Amazing. I hope to see you around town.